It’s a 1998 “60 Minutes” interview with multibillionaire trader George Soros that had gone missing for years. The word is he went to great lengths to suppress it. George Soros is a complex, conflicted man. That comes across in the video, which I urge you to see before it disappears again. On one hand, he’s a brilliant trader… one of the best the world has ever known. For almost two decades, his Quantum Fund achieved returns in excess of 30% per year. And two years it posted annual returns of more than 100%. That’s extraordinary. And he’s done it by following a systematic approach to trading that trend followers can appreciate. Sound familiar? Regular readers will recognize those principles. Soros is living proof that a disciplined, systematic approach to trading trends is the path to riches in the markets. In reality, he’s a card-carrying member of the globalist elite who runs the Open Society Foundations. He’s spent billions working behind-the-scenes to manipulate democratic elections and destroy our constitutional limitations on government. Recent document leaks show his global network had over 90 separate projects to influence election outcomes in Europe in recent years. He’s also destabilized the European Union by spending millions to promote mass immigration and open borders. In the U.S., he’s funded pro-Clinton propaganda outlets like Media Matters and ThinkProgress. And undercover videos by Project Veritas revealed that Soros has suspected funding ties to Democratic operatives involved in voter fraud, inciting riots and creating violence at Trump rallies. The bottom line is that Soros is all about sowing chaos in the system. And he has extraordinary power to push and pull markets. He made over a billion dollars by cratering the monetary system of Great Britain in a single day. Yes, he can single-handedly move markets. 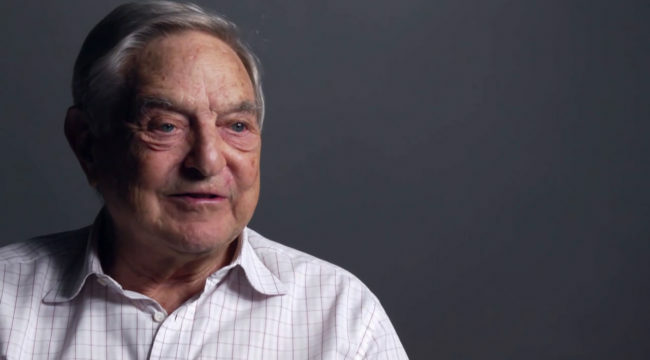 Look, what most investors either don’t realize or don’t want to admit is that there are highly influential forces like Soros working behind the curtains to shape world events. If you’re sitting at home thinking that there’s a system in place protecting you from these influences, you’re just easy prey. As citizens, we’re wide awake to the fact that Soros is an enemy of liberty, using his vast resources to cement his vision of a new world order. But as traders, we can take the best of what he has taught us about making money in the markets to our advantage. Be sure you choose to swim among the sharks instead of being the chum.